On October 23, 2014, the Internal Revenue Service in IR-2014-99 announced the cost-of-living adjustments that apply to dollar limits for retirement plans for the tax year beginning on January 1, 2015. Some of the limits experienced modest increases: salary deferrals and catch up limits increased by $500, annual maximum for defined contribution plans rose by $1,000. Other limits, such as maximum compensation, highly compensated employee compensation threshold, and compensation for determination of eligibility in a SEP IRA were also given a step-up. 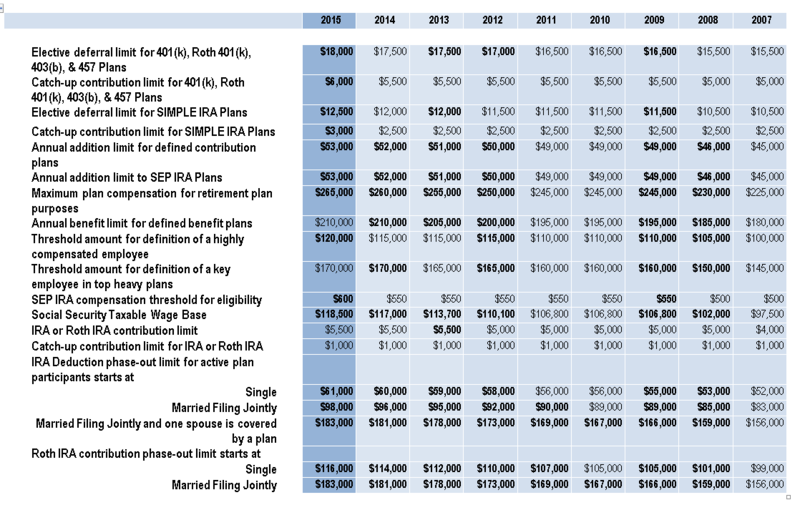 IRA contribution and catch up, defined benefit limit, and compensation limit for determination of key employee, as well as some other limits remain the same because the increase in the Consumer Price Index did not meet the required threshold for adjustment. In similar fashion, a day earlier, the Social Security Administration announced that a 1.7 percent adjustment to benefits and limits will be made for 2015, and the Social Security Taxable Wage base will increase from $117,000 to $118,500. For more information on how these limits may affect your clients and to take advantage of the opportunities they may present, please call us at (888) 926-0600 or send an email to pensions@firstallied.com. Your Retirement Plan Solutions Consultants are ready to help. *This Summary is designed to provide an overview of the dollar limitations for retirement plans and other relevant limits for 2015 and is not intended to be comprehensive.